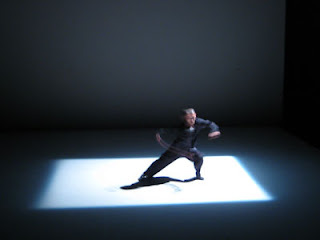 A stunning synchronicity of light, sound, vision, and dance defined Hiroaki Umeda's debut at Japan Society last night. He performed a modified version of two pieces: "Adapting for Distortion" and "Accumulated Layout." The first captured his mastery of projections. Infinite permutations of linear graphics cloaked his form in crossections, imbuing him with the otherworldly appearance of a CGI graphic. 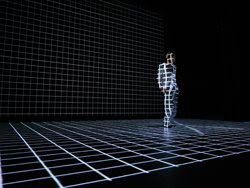 Umeda became an avatar of himself, and each tiny movement, whether his chest rising from breath or his shoulder swaying ever so slightly, distorted the lines and patterns across his body, which fit seamlessly with the distorted minimal synth noise that played concurrently. The second piece was more about body and sound than light, and it showed Umeda to be a master of minutiae. To begin, he controlled the tempo and movements of each tendon in his hand with an unreal precision, manipulating the manic energy that pulsed through his lithe form. The stuttering stop start of break beats in the background mirrored his body from moment to moment. Where he had dressed in white in the first piece, the second had him in all black. In each performance, he moved between the negative and positive space, between light and shadow with ease. The multi-sensory experience induced by the synergistic interplay Umeda created onstage is difficult to define in mere words, so catch his next two performances if you can on Friday and Saturday. As a solo artist at the creative helm of every aspect of his multimedia productions, Umeda is a force to be reckoned with.